Low-level laser therapy (LLLT) was discovered 50 years ago and has been used to treat wounds, pain, inflammation and cancer . LLLT applies low-powered red or near-infrared (NIR) laser light (1-500 mW of power levels and 600-1100 nm of wavelengths) to stimulate a biological response . These lasers generate a thermal effect without heating, sound, or vibration . It belongs to class 3 of laser classification. Recently, researchers have shifted the focus of research to the application of LLLT on brain disorders [1-3]. During the past decade, LLLT has been widely used to study neurological and psychological diseases  such as depressionlike behaviors [4-8], Alzheimer’s disease (AD) [9-20], Parkinson’s disease , stroke [22,23] and traumatic brain injury (TBI) [24-32]. Because red or NIR light can effectively penetrate into brain tissues [33,34], it can be noninvasive and play a beneficial role in increasing ATP biosynthesis and neurogenesis [1,2]. A number of excellent reviews have focused on LLLT for TBI [1-3,35], depression  and AD [35,37]. Increasing evidence supports roles for LLLT in rodent models of TBI [1,35]. Transcranial LLLT improved neuromuscular performance, increased brain derived neurotrophic factor (BDNF), reduced brain lesion volume, enhanced learning and memory, and overall improved the neurological severity score in mouse model of TBI [24,25,28-32]. In addition, the clinical studies found that LLLT could improve cognition and decrease depression, anxiety, headache and insomnia in patients with chronic TBI [26,27]. Thus, LLLT could be an alternative approach for treatment of TBI. Depression is a common mental disorder characterized by depressed mood, slow thought, diminished volitional activity, cognitive decline and somatic symptoms . Recently, Xu et al. investigated that LLLT effectively decreased depression-like behaviors; it also increased ATP biosynthesis and the level of mitochondrial complex IV expression and activity in two depressive-related mice models . The two mice models were space restriction and Abelson helper integration site-1 (Ahi1) knockout (KO) mice . In another study using forced swimming test (FST) and electrocorticography (ECoG) spectral analysis, transcranial LLLT was shown to successfully ameliorate depressive-related behavior induced by reserpine in rats . Further, LLLT could enhance outcomes for treatment of depression in clinical studies [6-8]. These results were summarized in Table 1. Collectively, this data suggest that transcranial LLLT has a beneficial role in depressive–related behaviors. Table 1: Summary of studies on LLLT for treatment of depression. AD, which is a chronic neurodegenerative disease, is characterized by a progressive decline in many cognitive functions, resulting in memory loss and dementia . Extracellular accumulation of amyloid β (Aβ) peptide aggregates, which results in the formation of senile plaques, indicates one of the neuropathological markers of AD . In recent years, accumulating evidence has suggested that transcranial LLLT suppresses Aβ-induced hippocampal neurodegeneration and long-term spatial and recognition memory impairments in rats that were injected bilaterally with Aβ 1-42 to the hippocampus CA1 region . Moreover, LLLT also inhibited Aβ 25-35-induced pheochromocytoma (PC12) cell apoptosis . Furthermore, laser irradiation with moderate levels of 670-nm light and epigallocatechin gallate (EGCG) supplementation complementarily decreased Aβ aggregates in human neuroblastoma (SHEP) cells . More detailed information was summarized in Table 2. Taken together, LLLT plays beneficial roles in AD. Table 2: Summary of studies on LLLT for treatment of Alzheimer’s disease. Depression is a common mental disorder. Studies have shown that the specific symptoms of depression in adults are closely related to three major monoamine neurotransmitters in the brain circuits including dopamine, serotonin and norepinephrine . The pathogenesis of depression is largely neurotransmitterdependent. Serotonin is a messenger that produces pleasure and affects almost every aspect of brain activity from regulating emotion, energy, and memory to shaping life . Therefore, antidepressants generally play a role by increasing brain serotonin . In addition, dopamine is also an important neurotransmitter which is closely related to depression, mainly used to transmit excitement and happiness . Both serotonin and dopamine levels in the hippocampus were significantly down-regulated in Ahi1 KO mice, which reveals depressive-like behaviors . Transcranial LLLT attenuated depressive-like behaviors in Ahi1 KO mice, which could be involved in the enhancement of serotonin and dopamine levels in the brain . Thus, the therapeutic mechanism of LLLT on depression is closely associated with monoamine neurotransmitters (Figure 1). Figure 1: The mechanisms of LLLT in depression. Light passes through the scalp and the skull, whereupon it is absorbed by cytochrome c oxidase in the mitochondrial respiratory chain of the cortical neurons. Adenosine triphosphate (ATP) biosynthesis is increased as a result of stimulated mitochondrial activity. LLLT might increase the secretion of monoamine neurotransmitters in the brain of Ahi 1 knockout mice. These monoamine neurotransmitters include serotonin and dopamine. Depression, which is characterized by lack of energy, impaired concentration and fatigue, is believed to be closely related to mitochondrial dysfunction [40-42]. These clinical symptoms may be partly attributed to reduced synthesis of adenosine triphosphate (ATP) due to mitochondrial dysfunction [41-43]. ATP, which is produced by mitochondria, is the main source of cellular energy. Energy is conserved via the mitochondrial respiratory chain as the socalled proton motive force. Transcranial LLLT promotes ATP biosynthesis and increases the expression level and activity of mitochondrial complex IV in mice prefrontal cortex in depressive mouse model . To support this idea, Ferraresi et al. illuminated that LLLT increases mitochondrial membrane potential and ATP synthesis in C2C12 myotubes . Therefore, the therapeutic mechanism of LLLT on depression may be associated with an increase of ATP-production caused by low-level laser irradiation (LLLI) (Figure 2). 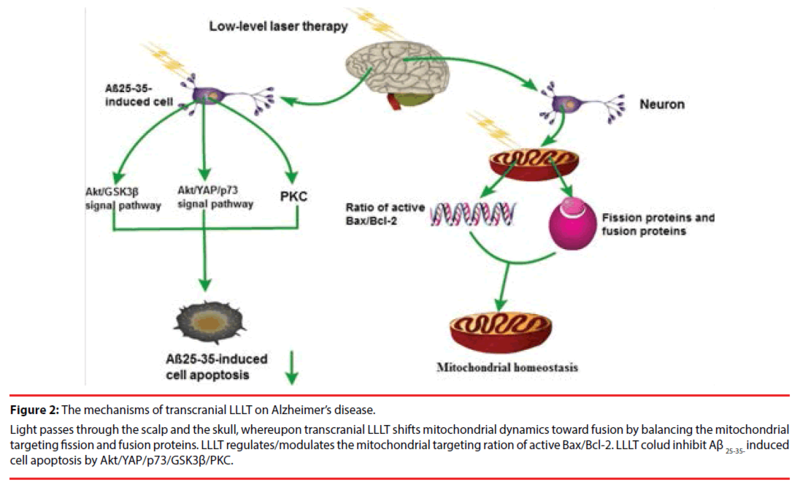 Figure 2: The mechanisms of transcranial LLLT on Alzheimer’s disease. Light passes through the scalp and the skull, whereupon transcranial LLLT shifts mitochondrial dynamics toward fusion by balancing the mitochondrial targeting fission and fusion proteins. LLLT regulates/modulates the mitochondrial targeting ration of active Bax/Bcl-2. LLLT colud inhibit Aβ 25-35- induced cell apoptosis by Akt/YAP/p73/GSK3β/PKC. Although the pathogenesis of AD remains unclear, it has been widely recognized that AD is characterized by extracellular Aβ plaque and neurofibrillary tangles within neurons . A large number of studies show that the development process and the pathogenesis of AD are closely related to a series of pathological processes including intracellular neurofibrillary tangles, oxidative stress, nerve inflammation and mitochondrial dysfunction with consequent neuronal dysfunction and cell death . Lu Y et al. illuminated that Aβ injection into the hippocampus led to mitochondrial abnormalities including impaired mitochondrial dynamics and mitochondrial fragmentation . In contrast, transcranial LLLT is able to shift mitochondrial dynamics toward fusion by balancing the mitochondrial targeting fission proteins and fusion proteins . Simultaneously, LLLT regulates the mitochondrial targeting ratio of active Bax/Bcl-2 and antioxidant level, intimating a vital role of LLLT in facilitating mitochondrial homeostasis and protection in hippocampal CA1 neurons . Collectively, the mechanism of LLLT in the treatment of AD is closely related to mitochondrial homeostasis [42,45]. Heat shock protein (HSP) signaling pathways are involved in AD . HSP reduction may lead to insufficient levels available to regulate abnormal polypeptide folding and processing, resulting in toxic accumulation which can initiate the apoptotic pathway, and may contribute to the progression of AD . Consistent with idea, Grillo et al examined whether LLLT upregulates HSP and reduces the aggregation of Aβ in TASTPM mice, a mouse model of AD . They found that LLLT treatment upregulates HSP, which reduce Aβ protein aggregation and neuronal apoptosis . The data suggest that LLLT treatment may regulate oxidative stress to combat AD . Inflammation is responsible for the pathophysiology of AD. De Taboada et al tested whether LLLT plays an anti-inflammation role in an Aβ protein precursor (AβPP) transgenic mouse model, a mouse model of AD . They found that LLLT treatment decreases Aβ plaques and the expression of inflammatory markers in the AβPP transgenic mice . In addition, LLLT treatment showed an increase in ATP levels, mitochondrial function, and c-fos, which result in an overall improvement in neurological function . The data suggest that LLLT is a potential candidate for treatment of AD. Although the molecular mechanism of LLLT in the treatment of AD is highly complex, increasing number of studies using LLLT was found recently. Zhang et al. have reported that Aβ 25-35 can induce pheochromocytoma (PC12) cell apoptosis by increasing the level of bax mRNA, and the anti-apoptotic effect of LLLT is dependent on the up-regulation of bclxl and down-regulation of bax via protein kinase C (PKC) activation pathway . Moreover, LLLT increased the nuclear translocation of β-catenin and enhanced its T cell factor/lymphocyte enhancer factor-dependent transcriptional activity via the Akt/GSK3β pathway to promote cell survival upon treatment with Aβ 25-35 . LLLT has a prosurvival effect on Aβ-induced apoptosis and may be an effective therapeutic strategy in treating AD by targeting GSK3b . In addition, another study on EGCG has also found that irradiation with moderate levels of 670-nm light and EGCG supplementation complementarily reduces Aβ aggregation in human neuroblastoma SH-EP cells . Further, Zhang et al. has uncovered evidence that LLLT could inhibit Aβ 25-35-induced cell apoptosis through activation of Akt/Yesassociated protein (YAP)/p73 signaling pathway . Taken together, these results directly point to a potential therapeutic strategy for the treatment of AD through Akt/YAP/p73/ GSK3β/PKC signaling pathways with LLLT (Fig. 2). Interesting, a recent study by Iaccarino et al demonstrated that entraining gamma oscillations (20 to 40 Hz), which is different from LLLT, may provide systemic effects in the brain to attenuate AD-related pathology through modulation of microglia . Further study in gamma oscillations and LLLT is warranted to examine whether it will have therapeutic effects in human AD. As a noninvasive treatment, accumulating evidence has shown that transcranial LLLT is a beneficial treatment for depression [4,5] and AD [10-17] in rodent models. In addition, transcranial LLLT has been carried out on depression and chronic TBI patients in preclinical trials [6-8,26,27]. With the increasing enthusiasm for studies on LLLT, the cellular and molecular mechanisms of LLLT are still at early stages. LLLT might be related to factors such as mitochondrial oxidative respiratory chain, Akt/YAP/p73/GSK3β/PKC signaling pathway, and neurogenesis, neuroplasticity, and monoamine neurotransmitters as mentioned above. However, the main mechanism of LLLT is closely related to the function of mitochondria in pathophysiological conditions [1,45]. Mitochondria might be the most important organelle within cells governing the LLLT responses [1,42]. Although the single and multiple applications of LLLT at the surface of the cerebral cortex appears to be safe within one year after treatment in animal model , LLLT, as a new therapeutic technology, needs more studies to prove its safety. In addition, we need to examine the effects of LLLT including laser wavelength, energy intensity, irradiation mode, and the duration of laser on physiological and pathological conditions. Further, we should explore other cellular and molecular mechanisms responsible for its effect. Most importantly, it is critical to test the effects of transcranial LLT in treatment of depression and AD in clinical trials. In conclusion, transcranial LLLT will shed new light on the treatment of psychological and neurological disorders. This work was partly supported by grants from the Qiqihar Medical University (QY2016-ZD1), Heilongjiang Province, China and the University of Missouri Research Board, Missouri, USA (XPC). Hamblin MR. Photobiomodulation for traumatic brain injury and stroke. J. Neuro. Res In press (2017). Hamblin MR. Shining light on the head: Photobiomodulation for brain disorders. BBA. Clin 6(1), 113-124 (2016). Rojas JC, Gonzalez-Lima F. Neurological and psychological applications of transcranial lasers and LEDs. Biochem. Pharmacol 86(4), 447-457 (2013). Xu Z, Guo X, Yang Y, et al. Low-level laser irradiation improves depression-like behaviors in mice. Mol. Neurobiol 54(6), 4551- 4559 (2017). Mohammed HS. Transcranial low-level infrared laser irradiation ameliorates depression induced by reserpine in rats. Lasers. Med. Sci 31(8), 1651-1656 (2016). Schiffer F, Johnston AL, Ravichandran C, et al. Psychological benefits 2 and 4 weeks after a single treatment with near infrared light to the forehead: a pilot study of 10 patients with major depression and anxiety. Behav. Brain. Funct 5(1), 46 (2009). Henderson TA, Morries LD. Multi-watt near-infrared phototherapy for the treatment of comorbid depression: an open-label single-arm study. Front. Psychiatry 8(1), 187 (2017). Disner SG, Beevers CG, Gonzalez-Lima F. Transcranial laser stimulation as neuroenhancement for attention bias modification in adults with elevated depression symptoms. Brain. Stimul 9(5), 780-787 (2016). Lu Y, Wang R, Dong Y, et al. Low-level laser therapy for beta amyloid toxicity in rat hippocampus. Neurobiol. Aging 49(1), 165-182 (2017). De Taboada L, Yu J, El-Amouri S, et al. Transcranial laser therapy attenuates amyloid-beta peptide neuropathology in amyloid-beta protein precursor transgenic mice. J. Alzheimer. Dis 23(1), 521-535 (2011). Grillo SL, Duggett NA, Ennaceur A, et al. Non-invasive infra-red therapy (1072 nm) reduces β-amyloid protein levels in the brain of an Alzheimer's disease mouse model, TASTPM. J. Photochem. Photobiol B 123(1), 13-22 (2013). Purushothuman S, Johnstone DM, Nandasena C, et al. Near infrared light mitigates cerebellar pathology in transgenic mouse models of dementia. Neurosci. Lett 591(1), 155-159 (2015). Michalikova S, Ennaceur A, van Rensburg R, et al. Emotional responses and memory performance of middle-age CD1 mice in a 3D maze: effects of low infrared light. Neurobiol. Learn. Mem 89(1), 480-488 (2008). da Luz Eltchechem C, Salgado ASI, Zangaro RA, et al. Transcranial LED therapy on amyloid-β toxin 25-35 in the hippocampal region of rats. Lasers. Med. Sci 32(4):749-756 (2017). Oron A, Oron U. Low-level laser therapy to the bone marrow ameliorates neurodegenerative disease progression in a mouse model of Alzheimer’s disease: a minireview. Photomed. Laser. Surg 34(12), 627-630 (2016). Farfara D, Tuby H, Trudler D, et al. Low-level laser therapy ameliorates disease progression in a mouse model of Alzheimer’s disease. J. Mol. Neurosci 55(2), 430-436 (2015). Liang J, Liu L, Xing D. Photobiomodulation by low-power laser irradiation attenuates Aβ-induced cell apoptosis through the Akt/GSK3beta/beta-catenin pathway. Free. Radic. Biol. Med 53(7), 1459-1467 (2012). Sommer AP, Bieschke J, Friedrich RP, et al. 670 nm laser light and EGCG complementarily reduce amyloid-β aggregates in human neuroblastoma cells: basis for treatment of Alzheimer's disease? Photomed. Laser. Surg 30(1), 54-60 (2012). Zhang H, Wu S, Xing D. Inhibition of Aβ (25-35)-induced cell apoptosis by low-power-laser-irradiation (LPLI) through promoting Akt-dependent YAP cytoplasmic translocation. Cell Signal 24(1), 224-232 (2012). Zhang L, Xing D, Zhu D, et al. Low-power laser irradiation inhibiting Aβ 25-35-induced PC12 cell apoptosis via PKC activation. Cell. Physiol. Biochem 22(1-4):215-222 (2008). Purushothuman S, Nandasena C, Johnstone DM, et al. The impact of near-infrared light on dopaminergic cell survival in a transgenic mouse model of Parkinsonism. Brain. Res 1535(1), 61-70 (2013). Huisa BN, Stemer AB, Walker MG, et al. Transcranial laser therapy for acute ischemic stroke: a pooled analysis of NEST-1 and NEST-2. Int. J. Stroke 8(5), 315-320 (2013). Lapchak PA, Boitano PD. Transcranial near-infrared laser therapy for stroke: how to recover from futility in the NEST-3 Clinical Trial. Acta. Neurochir. Suppl. 121(1), 7-12 (2016). Xuan W, Huang L, Hamblin MR. Repeated transcranial low-level laser therapy for traumatic brain injury in mice: biphasic dose response and long-term treatment outcome. J. Biophotonics 9(11-12), 1263-1272 (2016). Xuan W, Agrawal T, Huang L, et al. Low-level laser therapy for traumatic brain injury in mice increases brain derived neurotrophic factor (BDNF) and synaptogenesis. J. Biophotonics 8(6), 502-511 (2015). Morries LD, Cassano P, Henderson TA. Treatments for traumatic brain injury with emphasis on transcranial near-infrared laser phototherapy. Neuropsychiatr. Dis. Treat 11(1), 2159-2175 (2015). Henderson TA, Morries LD. SPECT perfusion imaging demonstrates improvement of traumatic brain injury with transcranial near-infrared laser phototherapy. Adv. Mind. Body. Med 29(4), 27-33 (2015). Xuan W, Vatansever F, Huang L, et al. Transcranial low-level laser therapy enhances learning, memory, and neuroprogenitor cells after traumatic brain injury in mice. J. Biomed. Opt 19(10), 108003 (2014). Xuan W, Vatansever F, Huang L, et al. Transcranial low-level laser therapy improves neurological performance in traumatic brain injury in mice: effect of treatment repetition regimen. PloS. One 8(1), e53454 (2013). Wu Q, Xuan W, Ando T, et al. Low-level laser therapy for closed-head traumatic brain injury in mice: effect of different wavelengths. Lasers. Surg .Med 44(3), 218-226 (2012). Quirk BJ, Torbey M, Buchmann E, et al. Near-infrared photobiomodulation in an animal model of traumatic brain injury: improvements at the behavioral and biochemical levels. Photomed. Laser. Surg 30(9), 523-529 (2012). Oron A, Oron U, Streeter J, et al. Near infrared transcranial laser therapy applied at various modes to mice following traumatic brain injury significantly reduces long-term neurological deficits. J. Neurotrauma 29(2), 401-407 (2012). Hennessy M, Hamblin MR. Photobiomodulation and the brain: a new paradigm. J. Optics 19(1), 013003 (2016). Henderson TA, Morries LD. Near-infrared photonic energy penetration: can infrared phototherapy effectively reach the Human brain? Neuropsychiatr. Dis. Treat 11(1), 2191-2208 (2015). Naeser MA, Hamblin MR. Potential for transcranial laser or LED therapy to treat stroke, traumatic brain injury, and neurodegenerative disease. Photomed. Laser. Surg 29(7), 443-446 (2011). Cassano P, Petrie SR, Hamblin MR, et al. Review of transcranial photobiomodulation for major depressive disorder: targeting brain metabolism, inflammation, oxidative stress, and neurogenesis. Neurophotonics 3(3), 031404 (2016). de la Torre JC. Treating cognitive impairment with transcranial low level laser therapy. J. Photochem. Photobiol B 168(1), 149-155 (2017). Nutt DJ. Relationship of neurotransmitters to the symptoms of major depressive disorder. J. Clin. Psychiatry 69 Suppl E1:4-7 (2008). Serrano-Pozo A, Frosch MP, Masliah E, et al. Neuropathological alterations in Alzheimer disease. Cold. Spring. Harb. P. Serspect. Med 1(1), a006189 (2011). Harmer CJ, Duman RS, Cowen PJ. How do antidepressants work? New perspectives for refining future treatment approaches. Lancet. Psychiatry 4(5), 409-418 (2017). Kasahara T, Kato T. What can mitochondrial DNA analysis tell us about mood disorders? Biol .Psychiatry S0006-3223(17), 31994-31997 (2017). Gonzalez-Lima F, Barksdale BR, Rojas JC. Mitochondrial respiration as a target for neuroprotection and cognitive enhancement. Biochem. Pharmacol 88(4), 584 -593 (2014). Karabatsiakis A, Bock C, Salinas-Manrique J, et al. Mitochondrial respiration in peripheral blood mononuclear cells correlates with depressive subsymptoms and severity of major depression. Transl. Psychiatry 4(1), e397 (2014). Ferraresi C, Kaippert B, Avci P, et al. Low-level laser (light) therapy increases mitochondrial membrane potential and ATP synthesis in C2C12 myotubes with a peak response at 3-6 h. Photochem. Photobiol 91(2), 411-416 (2015). Grimm A, Friedland K, Eckert A. Mitochondrial dysfunction: the missing link between aging and sporadic Alzheimer's disease. Biogerontology 17(2), 281-296 (2016). McCarthy TJ, De Taboada L, Hildebrandt PK, et al. Long-term safety of single and multiple infrared transcranial laser treatments in Sprague-Dawley rats. Photomed. Laser. Surg 28(5), 663-667 (2010). Wilhelmus MM, de Waal RM, Verbeek MM. Heat shock proteins and amateur chaperones in amyloid-Beta accumulation and clearance in Alzheimer’s disease. Mol. Neurobiol 35(1), 203-216 (2007). Iaccarino HF, Singer AC, Martorell AJ, et al. Gamma frequency entrainment attenuates amyloid load and modifies microglia. Nature 540(7632), 230-235 (2016).